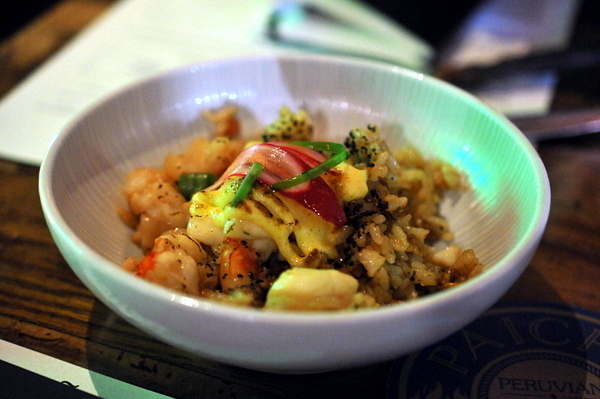 I'd heard about Shuck before but it was only after a ringing endorsement from Jason Quinn, the chef at Playground that I actually gave any serious thought to trying the place. Founded by Leonard Chen and Noah Blom, Shuck's point of differentiation is their direct relationship with oyster farmers. This means their oysters arrive within 2-3 days of being harvested instead of a week or more it would take when going through a distributor. As a result, Shuck offers the largest selection of oysters that I've ever seen though only 10 or so are ever in stock at any one time. Naturally I wanted to try every oyster available, but our shucker offered to do an oyster "omakase" of sorts, throwing a few unlisted oysters that he thought we might enjoy. The oysters come with grated horseradish, hot sauce, and mignonette but I found they were best enjoyed neat or perhaps with a drop of lemon juice. 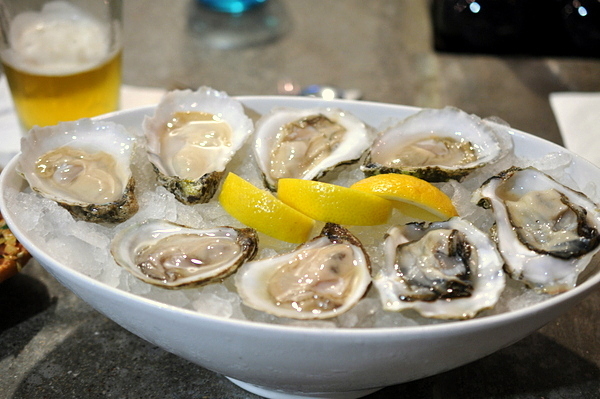 An East Coast oyster from Massachusetts, the Wellfleets were dense with a firm muscular bite and pleasantly balanced brine. Kusshi's are one of my all-time favorite oyster varieties and these little gems were no different, perhaps a touch heavier on the salt that I was expecting but still clean and sweet on the finish. The Stingrays are a Virginia river oyster raised in a bay that opens into the Chesapeake. The freshwater influence gives the oysters a lower salt content than most resulting in a clean, mild, and meaty bivalve. 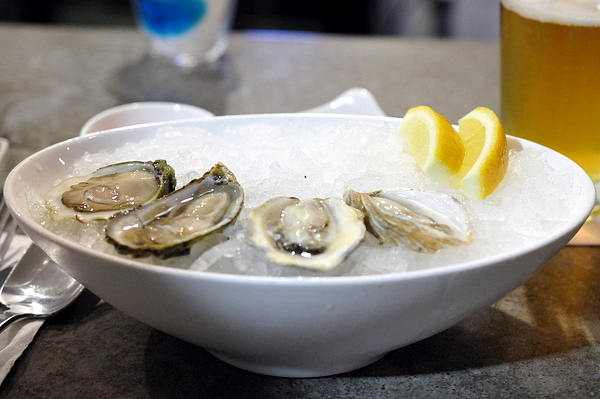 True to their name Hurricane oysters from PEI have a violently deep flavor of the sea. Shuck favors younger Hama Hamas, around 7mos instead of the 2-3 years they normally grow for; this results in a more concentrated flavor as well as a suppler texture. The Plymouths were the first of the special oysters and the best of this quartet. Grown near Plymouth Rock, these oysters have a strong briny character on the attack that evolves into a nuanced fruity sweetness. Our final trio of oysters was supposed to be the most flavorful. We started with the Blue Pools, briny with a deep vegetal bitterness, with a texture that is by turns snappy and creamy. The East Beach Blondes from Rhode Island had a keen salinity but remained clean and sweet unlike the Blue Pools. 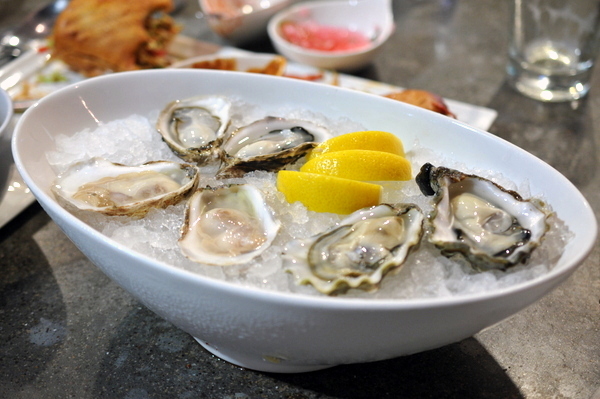 Our second unlisted oyster was the Naked Cowgirl, a new type of oyster grown in Totten Inlet, Washington from the farm that produces the Naked Cowboy Oysters in New York. Having had two bad experiences with Naked Cowboys I was a bit apprehensive but these were fantastic; showing a gentle melon-y sweetness and lingering creamy twang on the finish these were easily the best oysters of the night. I really thought I'd like this more than I did. 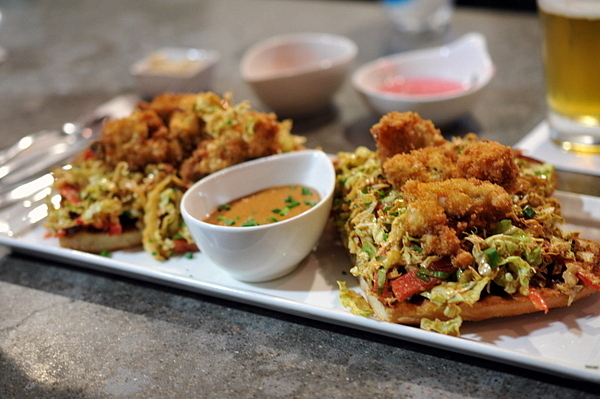 The oysters were nicely fried but when taken together the dark sauce seemed to muddle the flavors of the slaw and oysters into one undifferentiated mess. I would have liked a mayo-based slaw to add some moisture to the dish without compromising the integrity of the sandwich. Our server claimed that their chef, Noah, adhered to a classic roux based recipe for his clam chowder but I found the soup a bit thin. 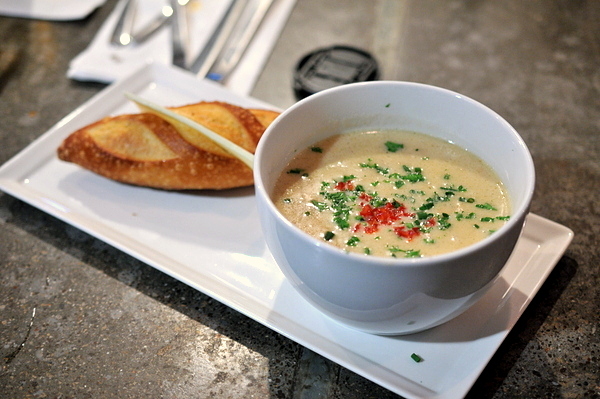 Further confusing matters was the soup's yellowish cast and subtle curry and lemongrass flavors that were all eerily reminiscent of Tom Kha. 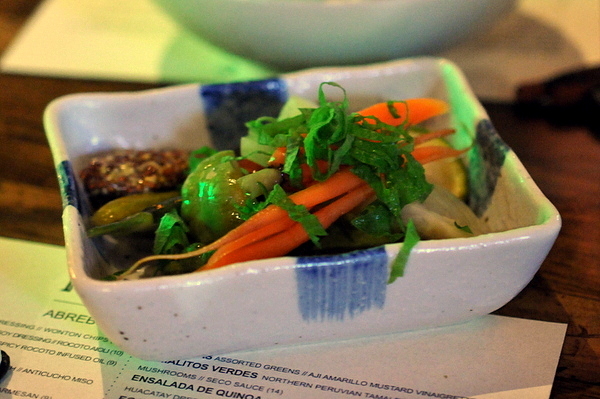 Of the hot foods this was the only dish we had that really resonated with me. 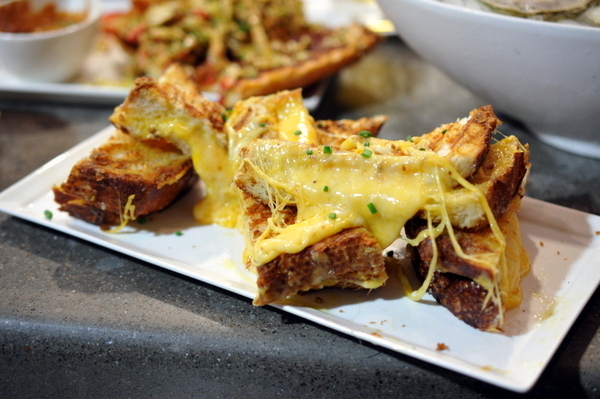 The hollow crunch of the toast coupled with the gooey zest of the grilled cheese conveys an endearing sense of comfort and satisfaction. 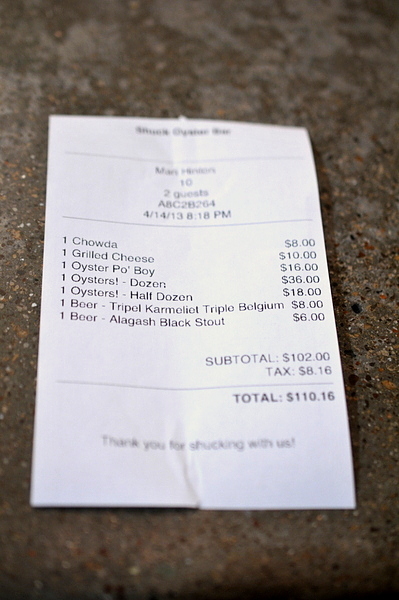 Shuck pretty much met my expectations on all counts. The cooked food wasn't anything to write home about, but if you're like me and suffer periodic debilitating cravings for oysters then Shuck will fit the bill quite nicely. 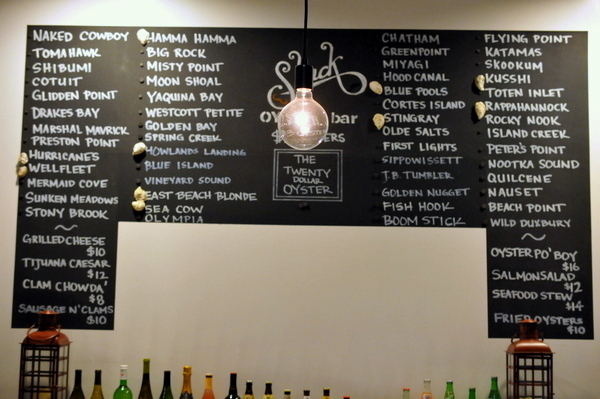 Fair warning, at $3 a pop satisfying that oyster lust can get expensive fast. It may be hard to believe but Ludovic Lefebvre, the king of pop-ups, has finally grown up and settled down. Partnering with the two dudes, Jon Shook and Vinny Dotolo, Ludo has opened his first permanent spot, Trois Mec. Rather than take the easy way out and creating a permanent version of his famous pop-up, Ludo opted for more of a bistronomy concept, serving fine dining in a more casual setting. 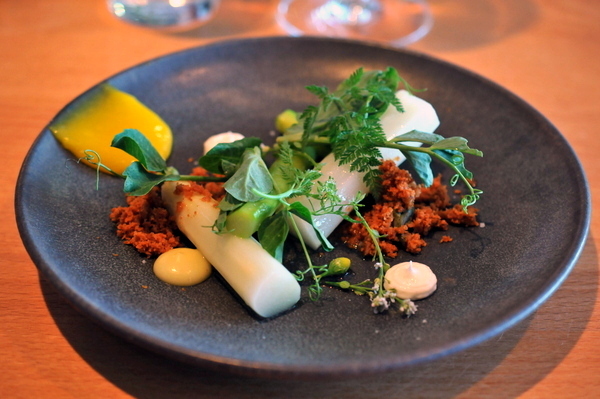 Taking a page from Grant Achatz's Next, Trois Mec utilizes a ticket system for its reservations with diners paying in advance for a prix fixe menu. 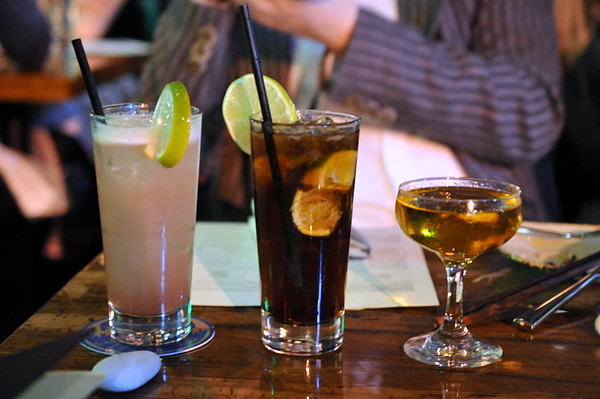 The welcoming cocktail consisted of a light beer made from mugwort, an aromatic herb used in Asian medicine. 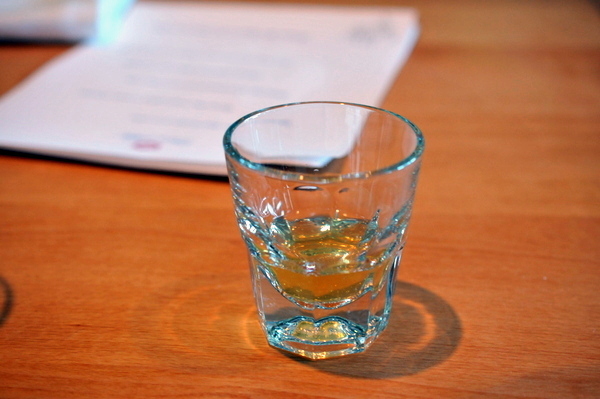 The beer is initially blunted by a sweet elderflower syrup, but a clean bitterness is apparent on the finish. The tiny granules have a crunchy savor similar to Japanese rice crackers that would be delicious but a bit simplistic on their own but the vinegar adds a delightfully nervy twang that really sets the "popcorn" off. Despite having the fresh levity of a salad, this dish packs an immensely satisfying savor.that made it my favorite course of the night. 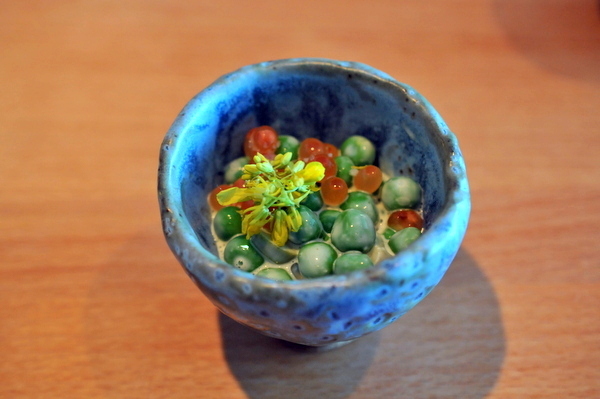 The taut grassy peas are tinged with an overarching acidity coupled with the deep umami essence of the marinated roe, easy to appreciate yet fantastically complex and nuanced. Our server called this Trois Mec's answer to Kyochon. In all honesty, the morsel lacks the simple glut of flavor of a fried chicken, but the bird certainly stands out on other merits. 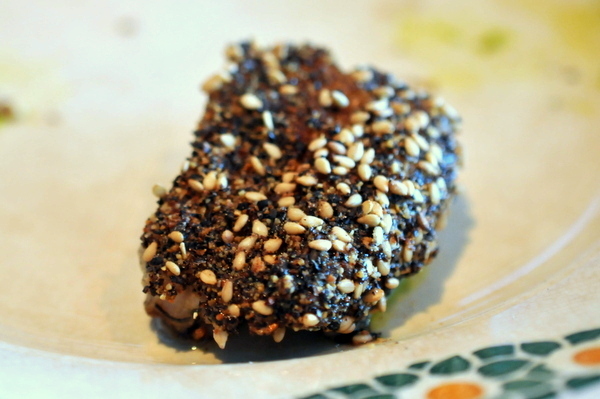 The flesh is moist and dense with an abiding wood smoke flavor tinged with the nutty sesame crust. Straddling the line between succulent and snappy, this was one of the most precisely cooked presentations of asparagus that I've ever had. The spry spears of white and green asparagus are deftly complimented by a bright yuzu gel while a buttery brioche soil adds a lovely buttery crunch. Curried carrots. Yogurt. Acid. Taken in pieces this course feels disjointed and jumbled but as a whole, the dish forms a coherent picture of smoky sweet barbeque sauce. 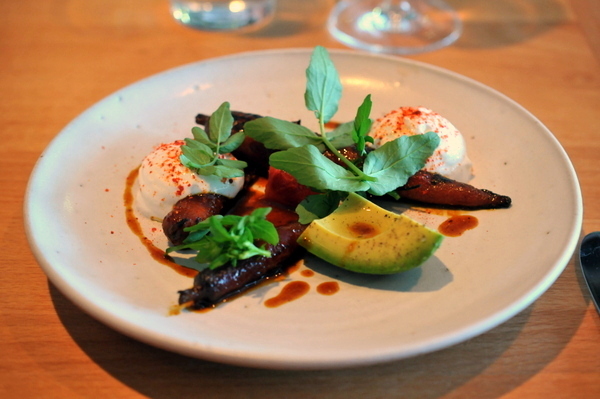 While I appreciated the creativity behind this dish, I've never been a fan of cooked carrots so I found this dish a bit challenging especially in the uneven bites. In addition while my carrots were cooked to an even tenderness, two of my companions has nearly inedible fibrous cores on theirs. 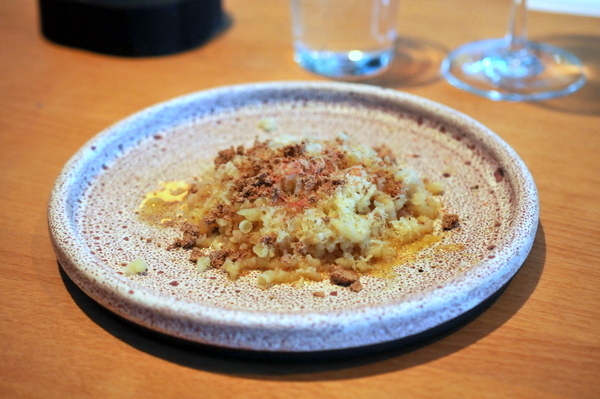 Ludo has been responsible for some of the most delicious potato dishes that I've ever eaten. With this course he wraps the starch in a cover of soft creamy cheese and dressing it with classic accompaniments of butter and onion in a way that still highlights the potato,. 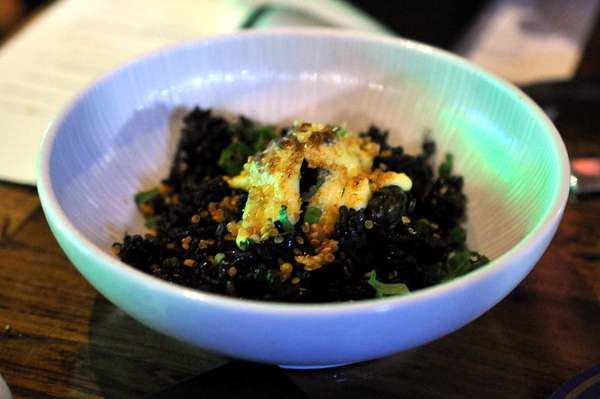 While I appreciated the purity of flavor, I would have liked a protein to headline the dish. Ludo has cooked up some amazing steaks in his time and this French onion soup inspired creation is among his best work. The meat is wonderfully tender and laden with rich beefy goodness. The fragrant shallot broth adds another level of complexity to the beef while the spelt imparts a soft nutty rusticity to the dish. 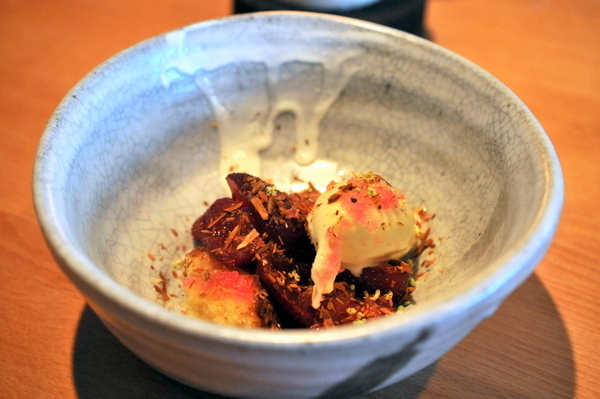 A cross between strawberry shortcake and strawberries and cream, the dessert struck a beautiful balance between fruit and richness. The sweet floral perfume of the vanilla soaked strawberries is complimented a quinelle of creamy almond ice cream while the dense cake soaks gives some much-needed heft to the dessert. I was expecting something obscenely sweet but the tart was actually quite balanced with the cumin which imparted a light spice on the finish. After attending one of the soft opening dinners at the beginning of the month, I thought the menu still needed some fine tuning with a number of dishes still lacking balance. Perhaps I shouldn't be surprised, but in the two weeks since my last visit, Ludo fine tuned the courses and dispelled most of my concerns. 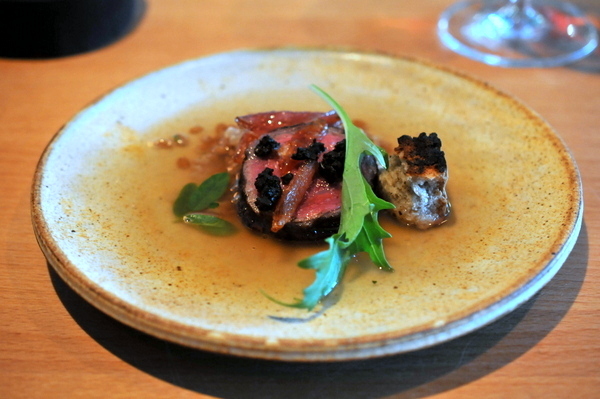 The menu may be a bit less ostentatious and eclectic than what he was doing at LudoBites but the food feels a bit more refined and elegant and more importantly: no less delicious. It's hard to believe that a mere 5 years ago Chef Ricardo Zarate was toiling away in relative obscurity at his original Mo-Chica located in the food court at Mercado La Paloma. 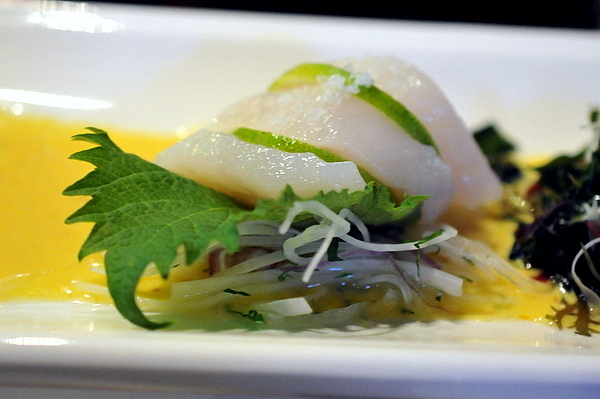 Since then he has become the authority on contemporary Peruvian food in Los Angeles. Ricardo spent 12 years in London before opening Mo-Chica in 2009 which garnered immediate critical acclaim and introduced Zarate to his future partner Stephane Bombet. 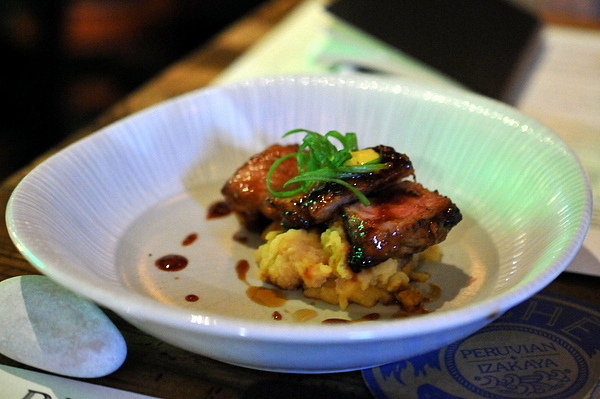 The duo have been opening new restaurants at about the rate of one per year. 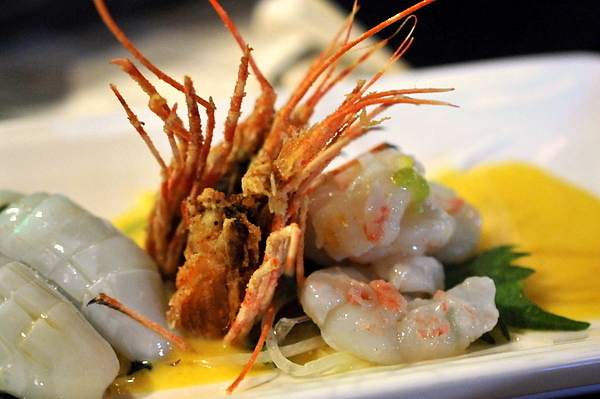 Their first partnership, Picca opened in June of 2011 which was arguably the city's hottest restaurant for a number of months. 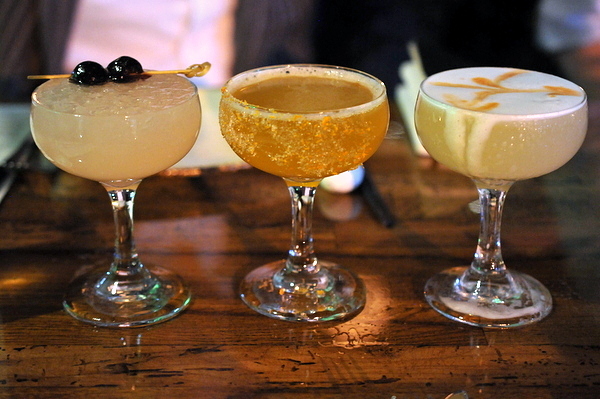 About a year later, they gentrified Mo-Chica, added a cocktail program, and moved it from the Mercado to a new home on 7th street in Downtown. 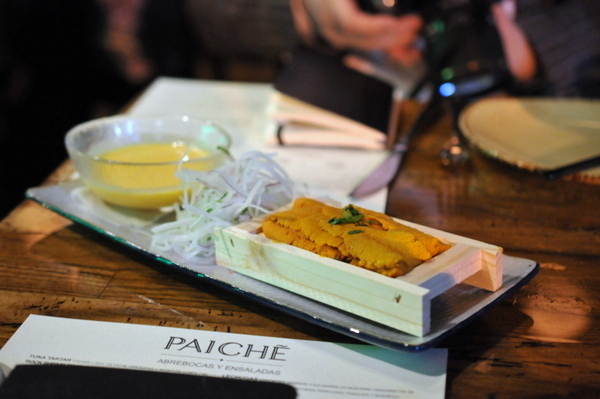 Now a little less than a year later the duo are ready to unveil their newest creation: Paiche, a Peruvian Izakaya. The Papa Hemmingway was the most interesting of the three cocktails; a study of citrus coupled with elusive other flavors. 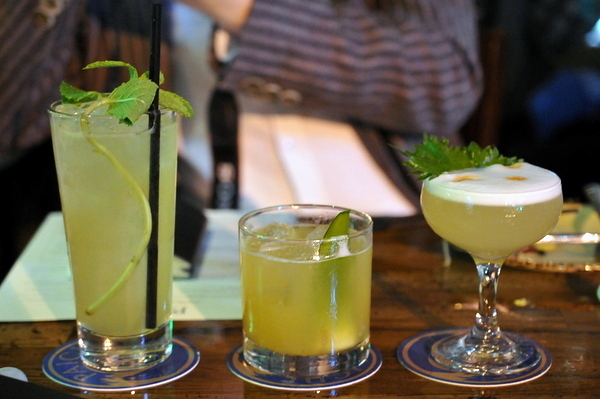 Both the Sidecar and the Pisco sour were on the boozy side. The former had a strong floral and orange component that smelled like orange candy but wasn't overwhelmingly sweet on the palate. The Pisco Sour was pretty prototypical, lightly tangy with a thick frothy topping of egg white foam. 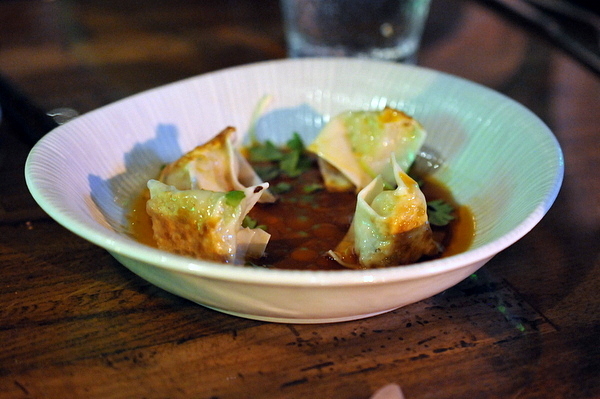 These dumplings had a very homey fried wonton character to them with a noticeably tender texture thanks to the inclusion of shrimp. The sauce is on the sour side but which acts as a break on the richness of the filling. I did find the dumpling skin a little dry at the edges but other than that a very tasty bite. 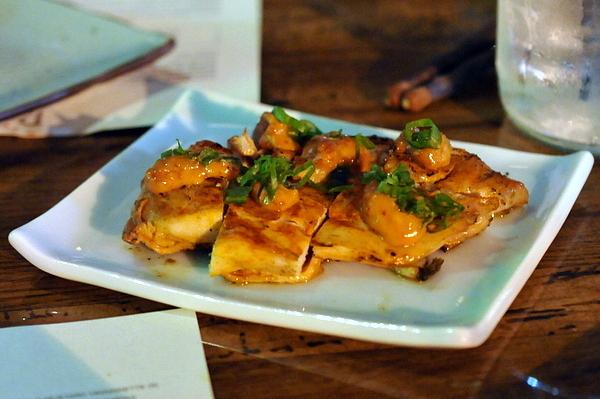 Fittingly, the restaurant's namesake fish appears frequently on the menu. 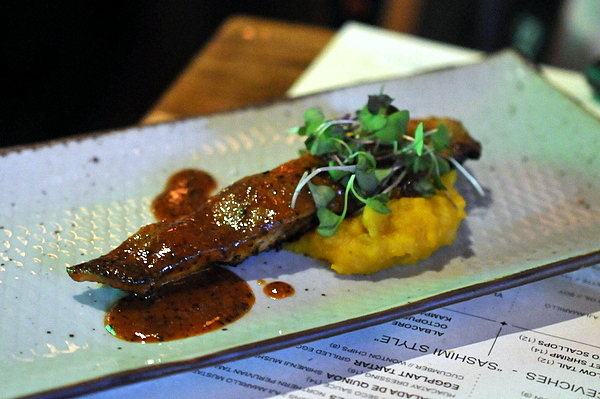 The grilled fish is fairly subdued to start but picks up on the finish with a lingering char, a nice contrast to the sweet pickled tang on the attack. The idea a sea urchin ceviche has appealed to me ever since I watched American Psycho and after all these years I finally got to try one. While I normally enjoy my uni with minimal accompaniments I was expecting a bit more here maybe some sort of relish or vegetable that typically comes in ceviche. On its own the uni has a faintly bitter finish though the flavor is effectively masked by the zest of the leche de tigre. Stephane brought this to our table by mistake and when we told him he just smiled, shrugged, and gave it to us as a gift. Easily the most girly of the cocktails the aroma of fresh strawberries is almost overwhelming, though the citrus plays a bigger role on the palate, the result was reminiscent of a vinous sparkling strawberry limeade. 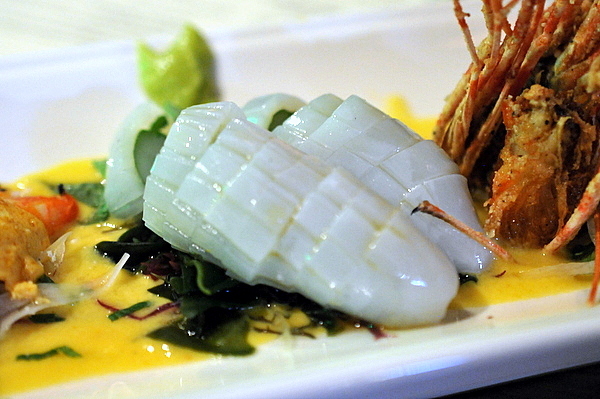 With Paiche, Ricardo has opted for a more minimalist approach to his ceviches that wouldn't have been out of place at a sushi restaurant. Instead of the typical accompaniments of corn and sweet potato they largely come with a bit of seaweed and onion and little else. 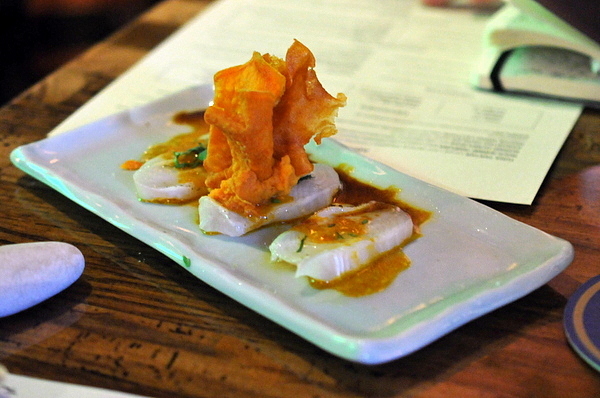 The squid ceviche came rolled around a shiso leaf, a classic combination that didn't really benefit from the leche de tigre. By far the heaviest of the ceviches we tried, the crab came covered in a thick blanket of melted cheese which provided a nice weighty counterpoint to the bracing marinade. This was the one big let down of the night. 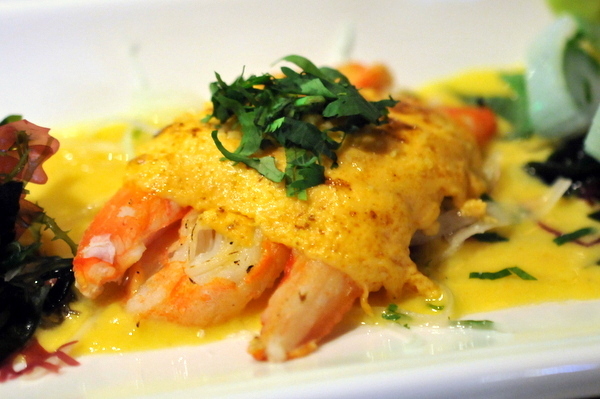 The shrimp quality was seriously flawed with a mealy texture and brackish bitter aftertaste though the leche de tigre did help mask some of the latter issue. The scallops were probably my favorite of the ceviches. Beautifully fleshy and sweet with a generous dusting of salt and a sharp acidic tang from the contact with the limes, very reminiscent of a sashimi. There was some disagreement about ordering the tartare, but this proved to be a nice departure from the typical tired preparations. The fish has a pleasing oiliness while the dressing adds a forceful heat-laced acidity to the fish. 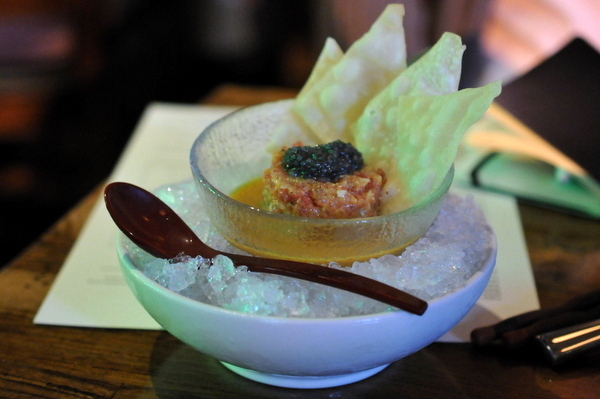 The topping of caviar was quite generous but was best used sparingly as an compliment to the fish. The pickles were quite tasty, cool and crisp with a sweet mustard verve, we probably should have paired them with some of the heavier courses later, but they were quite tasty on their own as well. 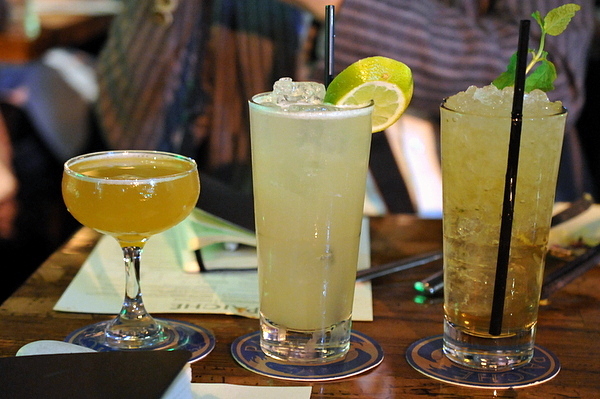 This was easily the strongest round of cocktails despite having a fairly typical mojito in the line up. The Oaxacalifornia Love was hands down the table favorite, with a lusty smoky flavor up front, a spicy kick to follow, and subtle tropical notes on the finish. The Last Ice Age was a close second, reminiscent of a sweet Pisco sour with floral nuances from the fruit and mint. 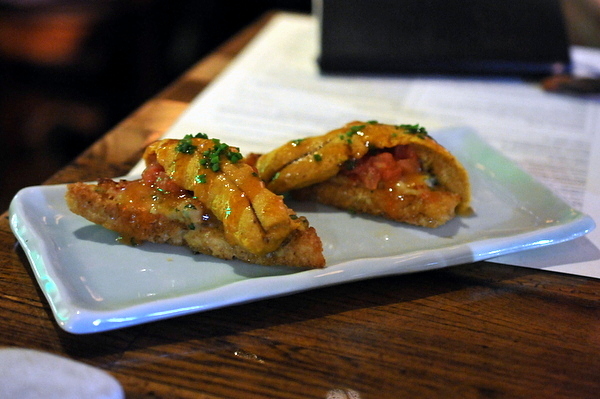 I don't think I've ever had a bad shrimp toast and adding uni to the mix just makes everything that much more delicious. 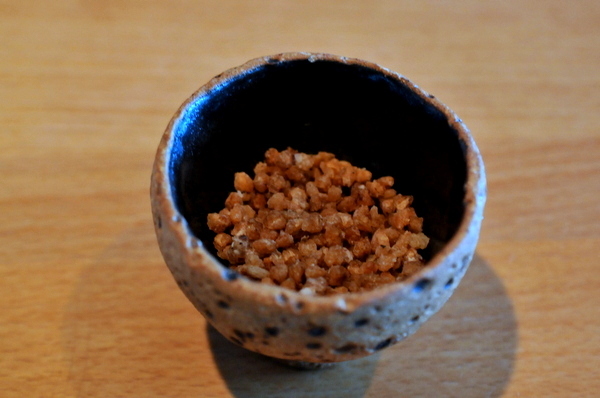 The crisp toast point is covered with a shrimp paste that has a subtle umami funk similar to Vietnamese fish sauce that is augmented by the urchin roe. The drizzle of sauce adds a beautiful spicy sweetness that ties the dish together pefectly. 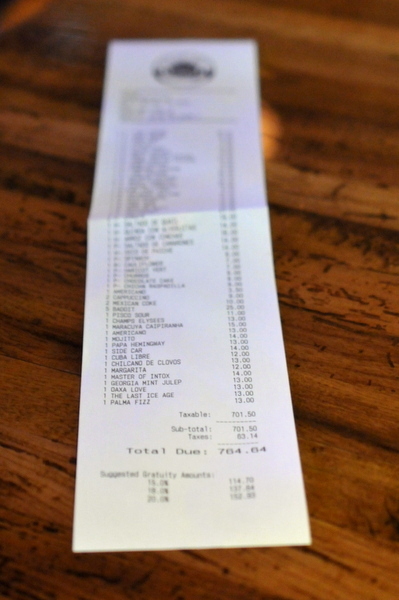 The entire group liked this so much that we ended up getting a second order. 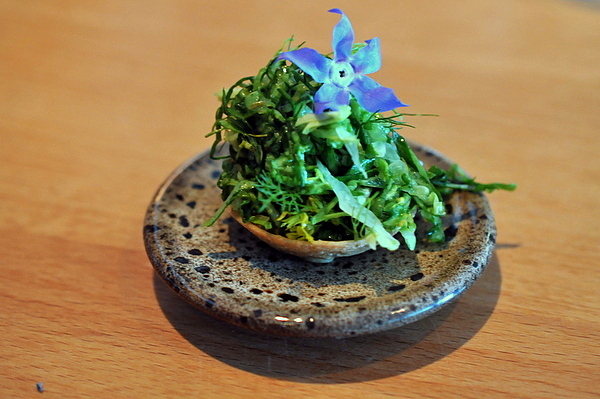 This course brings back fond memories of a similar dish from Nobu Malibu I had back when I first started dining out. The shrimp itself is somewhat lost here under layers of crisp buttery filo though the spicy twang of the jalapeño ponzu had us licking our lips and looking for bread. The paiche was beautifully cooked, flaky, moist and full of savor very reminiscent of the steamed fish found at a Chinese banquet. Personally I thought the fish had more than enough flavor and found the heavy dose of sweet potato a bit baffling and unnecessary. The Palma Fizz offered a mouth-puckering acidity verging on bitterness coupled with gingery bite on the finish. 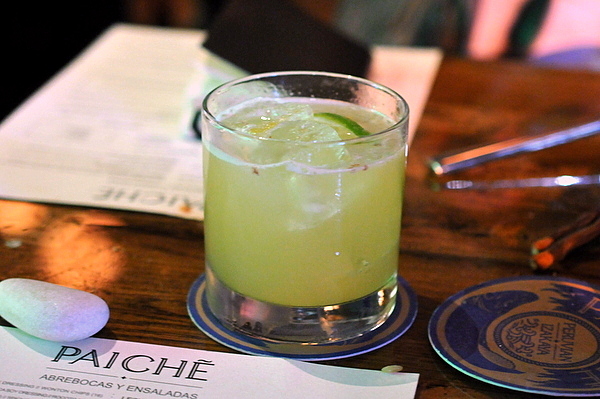 I've never been a fan of Cuba Libres, basically a rum and coke with lime, the drink feels almost too simple to be part of the lineup at Paiche. The Devoto was indeed the master of intoxication with a firey boozy punch that burns all the way down, but despite the abundance of alcohol the cocktail actually has a fairly innocuous herb and caramel tinged flavor. The squid and sausage was everything I had hoped for. The snappy squid acts as a casing for the ground chorizo and absorbs all the sausage's fatty runoff giving the entire dish a lovely meaty sapor. Personally I didn't need the aji pepian which I thought had a slight cloying sweetness to it. Humorous name aside, a spatchcock or spattlecock refers to a poultry or game that has had its sternum and backbone removed and "butterflied." Made from the tenderloin of the chicken, the meat was moist but I would have liked to see some more intrinsic flavor from the bird itself. Perhaps a drumstick or thigh would have been more effective instead of relying entirely on the sauce. Pacu is a cousin of the piranha that can grow up to 3 feet in length and 55 pounds in weight. The rib meat is laced with gooey collagen and fat giving it a much richer flavor and more complex feel than a filet would have. The spicy sweet sauce was nicely matched to the meaty rib, though the pumpkin was a bit heavy-handed but readers will know that I've never been a fan of sweet gourds. The Champs Elysees was reminiscent of the Sidecar but with a grape juice like sweetness on the attack. 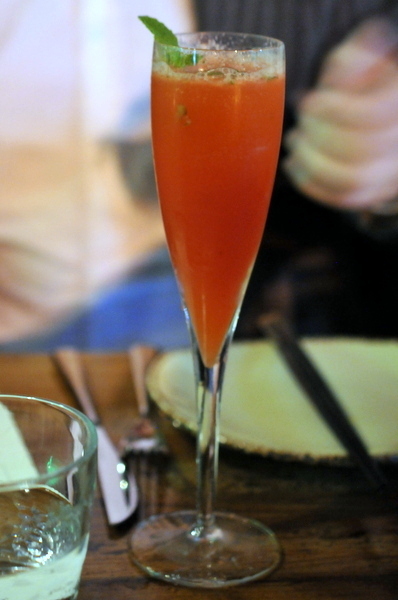 The Chilcano was similar to the Palma Fizz but lighter on the acid and with a hint of herb-y verve from the cloves. The soft minty sweetness of the Julep was true to form but there was also a muscat grape like fruitiness that was a pleasant surprise. 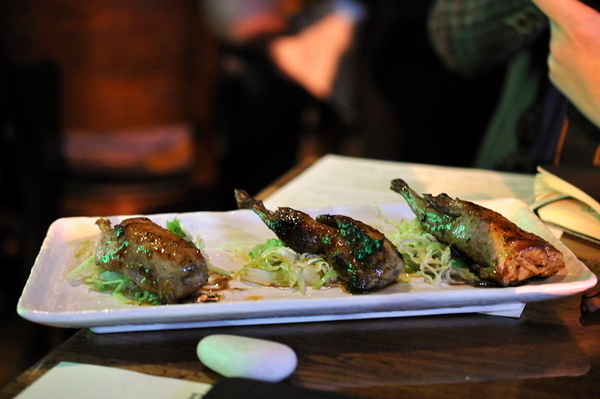 The grilled quail was one of the highlights of the night, immensely succulent and flavorful with a sweet dark savor and rich woody char. The potatoes while unnecessary were a nice touch, providing a starchy counterpoint and laden with heady butter and onion flavors. Given my penchant for risotto and uni this was a no brainer. The rice is a bit on the dry side for a risotto but the squid ink gives it an intense salinity heightened by the shellfish. A bit of heat finishes off the dish with the right amount of spicy kick. Our final Paiche course was fittingly the heaviest of the bunch. 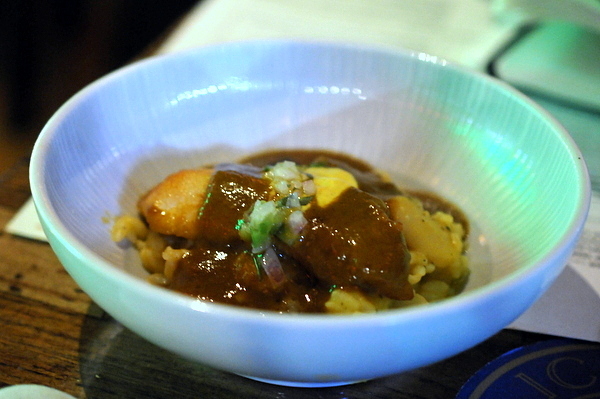 The dark sauce gives the dish a meaty stew-like flavor embellished by the tender starchiness of the pallares. 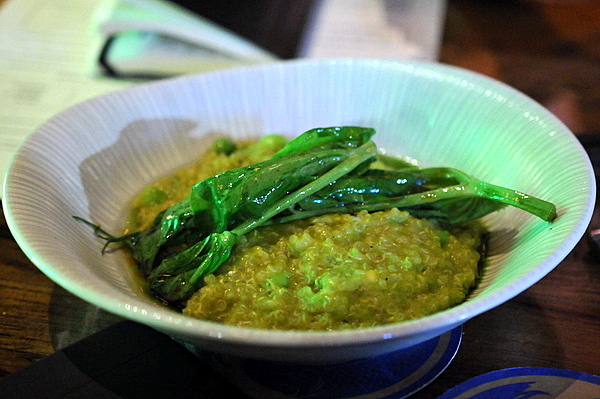 Though done in a risotto style the quinoa just doesn't have the same appeal. The quinoa seeds have a nutty flavor complimented by the fresh herbaceous verve of the peas. Having made a first pass thru the menu we decided to to go back and pick up some other dishes that caught our eye. 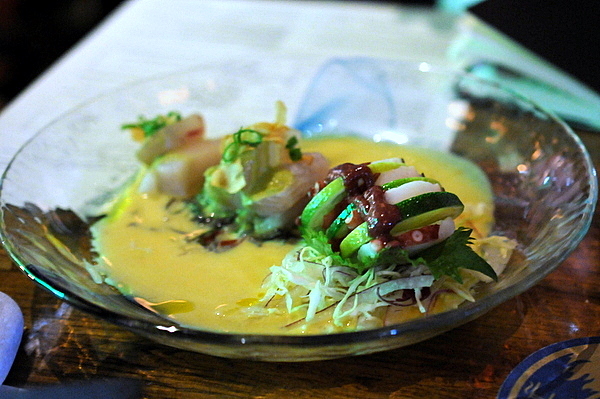 First of was a duet of Kampachi and Octpus ceviches. 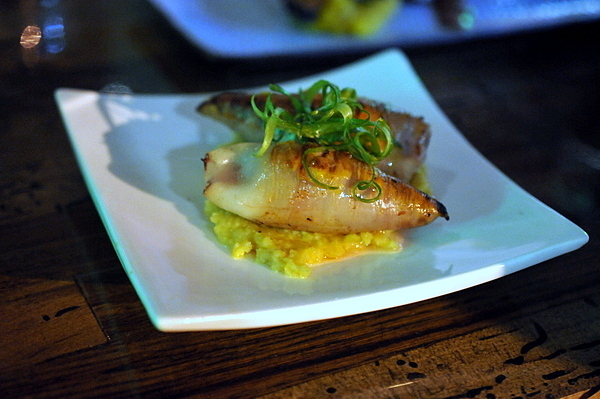 The octopus was served similar to the scallop interleaved with thinly sliced lime. The Kanpachi was arguably the densest example of the fish that I've ever eaten, the dense muscular texture reminiscent of halibut adductor muscle. 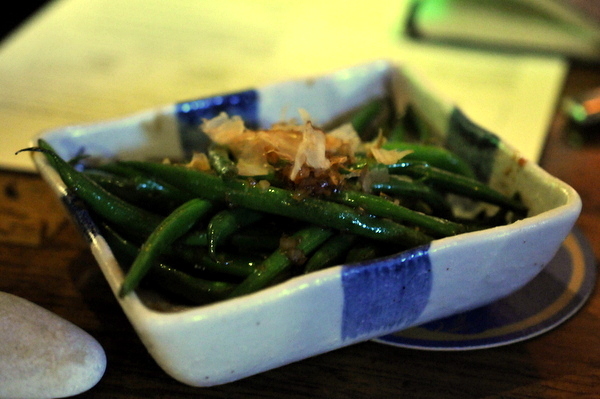 The haricot vert was cooked to perfection snappy squeaky string beans, sweet and vegetal with a smoky salty twang from the shaved bonito topping. 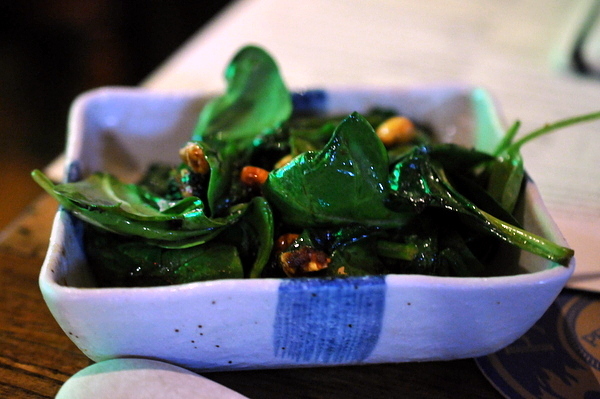 The spinach was well cooked as well slighty bitter and nutty but the topping of toasted corn kernels was a bit too tough and didn't really bring much to the dish. Despite all being classic cocktails the final trio all had some surprises to them. The Americano had a nice balance of citrus and bitterness with a pleasing effervescence. 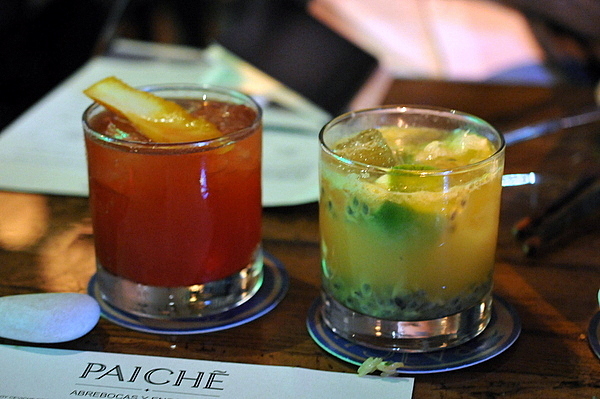 The passion fruit in the Caipirinha was a pleasant surprise, intensely fruity with a nice crunch from the seeds. The margarita might be the best example of the drink that I've ever had; fresh and fruity, but overly syrupy and with a mezcal like smokiness. The pork neck took an incredibly long time to arrive but it was well worth it. 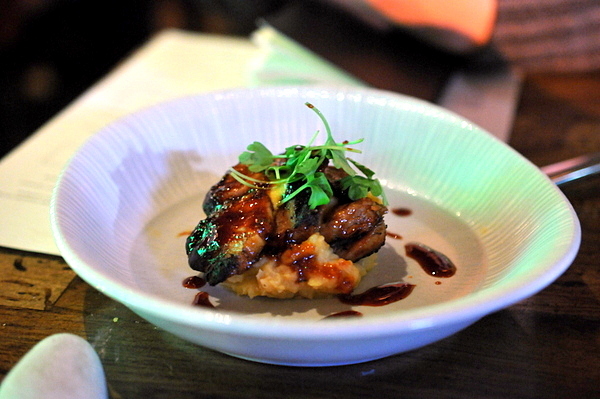 The caramelized charred exterior has a sweetness reminiscent of chashu complimented by heat from the gochujang. Looks like Zarate is taking a page from McDonald's new Fish McBites with this course albeit with some gentrification involved. 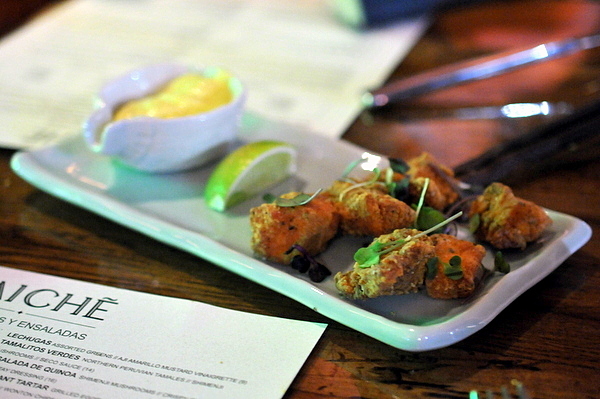 The fish bites were a touch overdone and with too much batter to fish but the flavor was spot on especially with the lime yuzu dipping sauce. 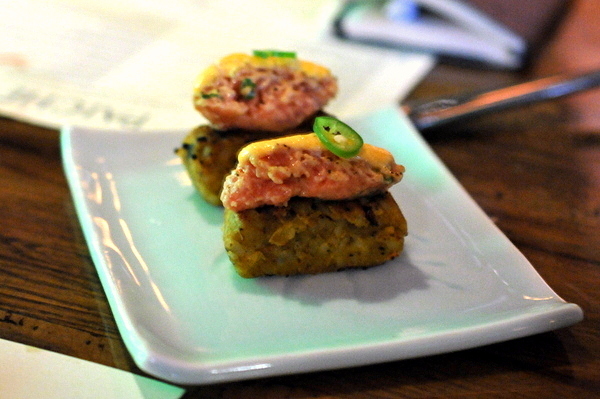 This reminded me of the spicy tuna causa that Zarate serves at Picca, but instead of spicy mashed potato, the base is a paste of crispy lentils. 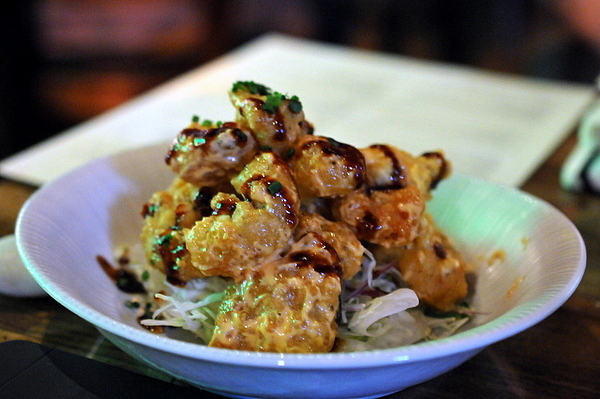 These reminded our entire party of Walnut Shrimp, the mayo slathered battered shrimp popular at Cantonese restaurants. Tasty but, like the chicharron de pescado, too much batter and not enough filling. 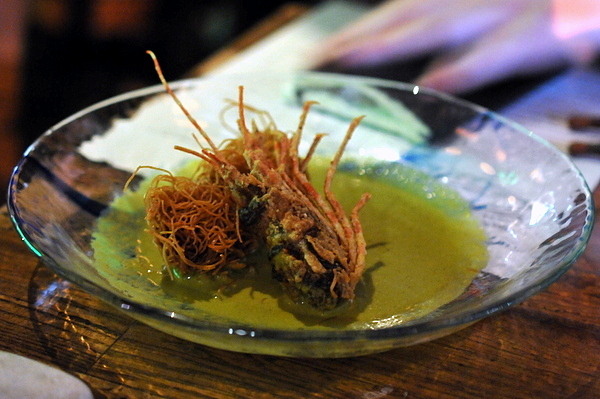 The dish came on a bed of cabbage which helped counter the creamy heft of the tempura. The saltado de quail was one of the tenderest preparation of the bird that I've ever had. The drumstick was falling off the bone tender and the thigh was meaty and succulent with a gamy essence dressed with a awesome mix of Eastern and Western flavors. The saltado de camarones didn't quite measure up to the quail. The shrimp in particular didn't stand out texturally but the thick noodles had an enjoyable flavor, laden with chili and ginger with an herbaceous finish. When Stephane brought the desserts around, he mentioned that Waylynn Lucas was responsible for all the desserts. 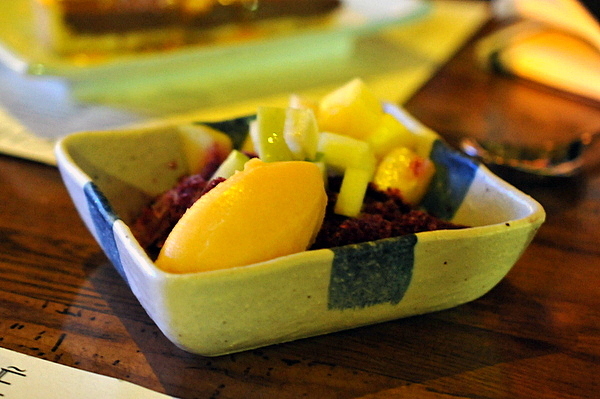 First up was a chicha raspadilla shaved ice with tangerine sorbet and frozen apple and pineapple. Chicha is a fermented beverage in this case made from raspberry that I found a bit disconcerting though I enjoyed the fruits and the sorbet. 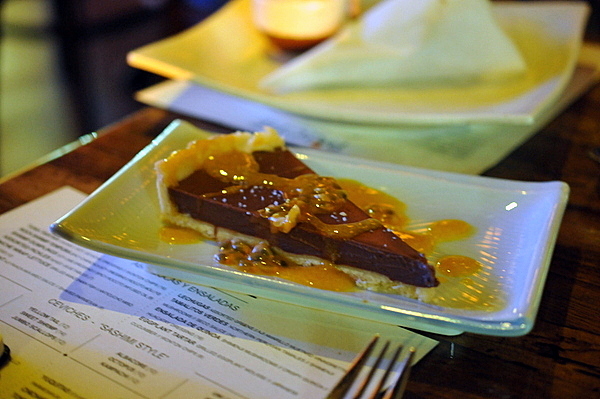 The chocolate torte was sinfully rich, creamy, and chocolatey. Straightforward and delicious on its own, the drizzle of passion fruit adds a bright fruity foil that appreciably lightens the dessert. 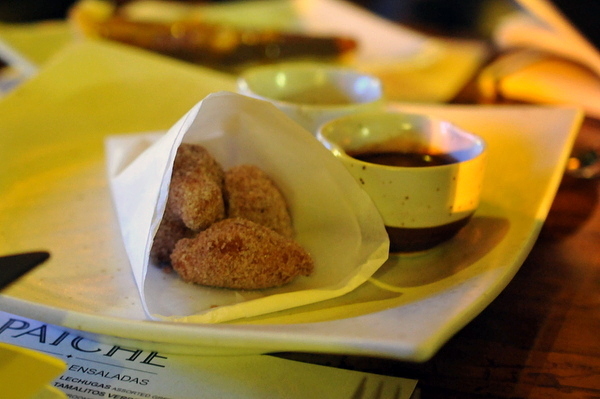 The churro bites came dusted with cinnamon sugar and had a crisp exterior wrapped around a slightly gooey core. The came with two dipping sauces but I preferred them on their own. 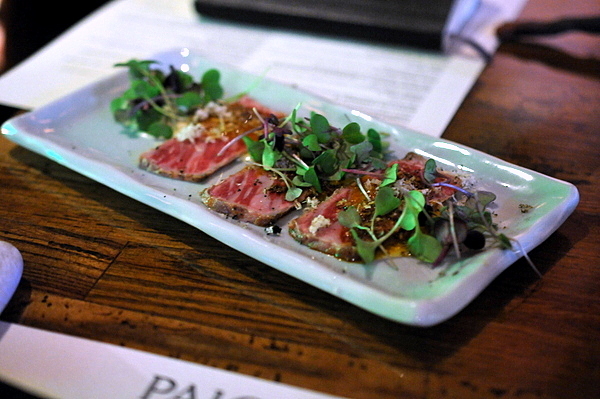 I had imagined Paiche would be a departure from Picca and despite the Japanese influences that are just as prominent here the restaurant does feel markedly different from its older sibling. 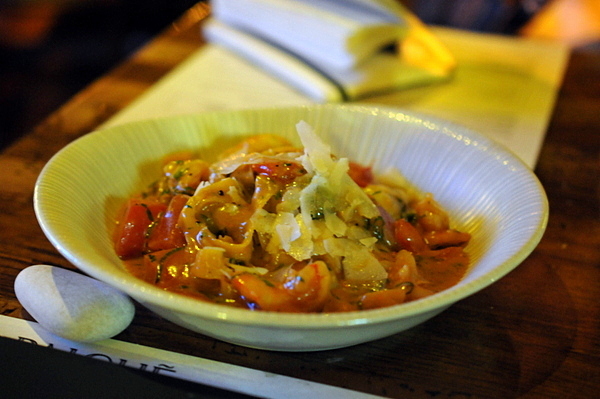 On the whole, I prefer the food at Picca. 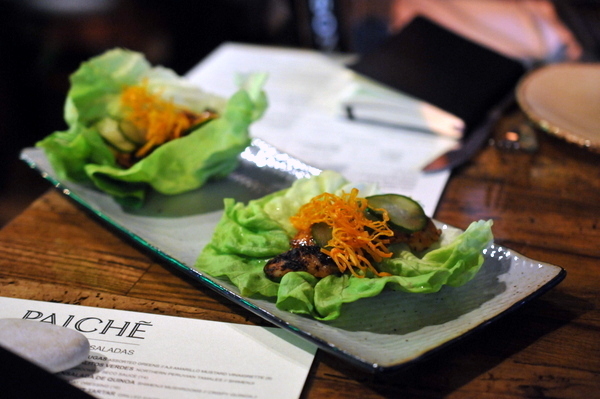 The ceviches at Paiche were too similar to one another and the debacle with the sweet shrimp was especially disappointing; though the meal did pick up with the heavier dishes, particularly the rice dishes and the quail. 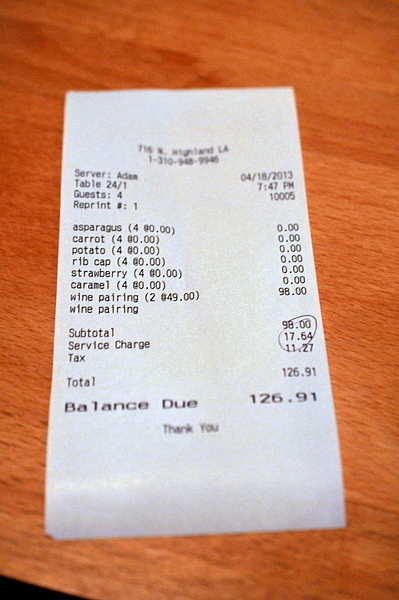 Food aside there, between 7:45 and 9:45, the kitchen was slammed and we had multiple delays between courses one of which was almost 45 minutes long. Considering it was the first night of full dinner service and they did 306 covers I suppose the delays can be forgiven and to their credit the staff was attentive throughout the evening. 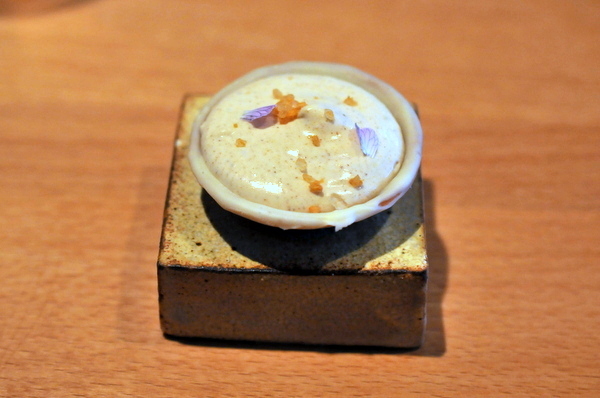 While I did have some issues with Paiche, every restaurant goes through some growing pains; if Ricardo and Stephane can work out the kinks, I suspect they will have another winner on their hands.